For those worried about the environmental impact of coffee pods, we recently got in these excellent single-serve coffee pods from the company San Francisco Bay. Using a unique packaging process, 97% of the pod is biodegradable. 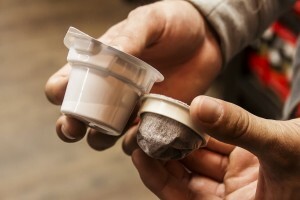 Stay environmentally conscious while still getting the convenience of a single-serve machine. We carry 9 different flavours of the San Francisco Bay company each one bringing their own disctinct flavour nodes from the mellow, yet smooth Breakfast Blend to the bold and vibrant French Roast coffee. As you can see, the packaging is much smaller with less plastic than the classic single-serve pods.